Adrienneats: Want a healthy heart? Snack on walnuts. Want a healthy heart? Snack on walnuts. 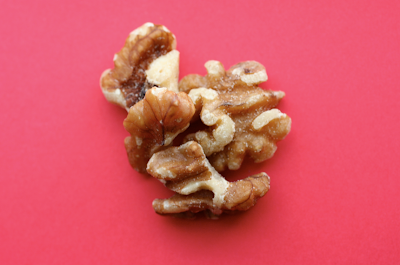 Walnuts are full of omega 3 essential fatty acids. Yes, I said fat. Fat is not a bad thing. Your body needs it. This good fat helps lower blood pressure. Walnuts have the highest source of antioxidants for tree nuts along with pecans and chestnuts. They also contain ellagic acid that promotes a healthy immune system. Two tablespoons of walnuts is a complete serving. I enjoy walnuts added to granola, trail mix, salads and in this dressing. Add to spinach salads, raw kale salads or grain salads for a delicious way to get more polyunsaturated fats in the diet.